Here’s an easy bath that you can try at home. 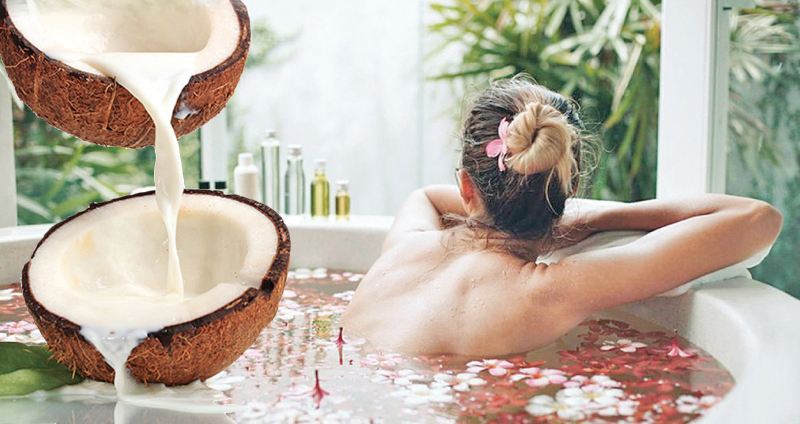 To prepare the coconut milk soak, add coconut milk and some honey to a bowl. Honey makes for a natural serum and moisturiser. Add a few drops of lavender or rose oil as this uplifts the mood. Mix and add it to the bucket and you’re set! You can also add half a cup of oatmeal to your bath. For another luxe soak, add a cup of pink Himalayan salts to the water. The salts have minerals, they infuse the body with hydration and aid relaxation. Coconut milk is anti-inflammatory. It also has vitamins C, E and B6, iron as well as magnesium.